By utilising both our Touch Screen and Online booking systems together you can offer your members the option to reserve online from anywhere in the world, whilst still giving them the option to book onsite. Both systems link up directly so whether you book online or via our mobile platform, or use one of a possible many Touch Screen systems located onsite, all of the onscreen information is kept upto date. 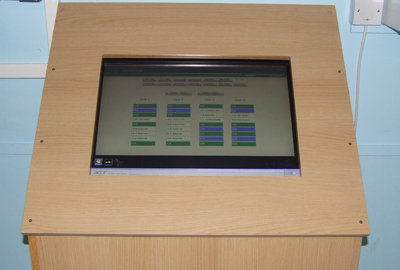 Our Touch Screen Booking Systems boast a large 21" touch screen and are encased in solid wood units. They provide a self managed portal for your members to make reservations onsite. Members simply enter a password to add and manage their bookings. Our Online Booking System allows your members to make reservations online and provides access to the booking system administration section. 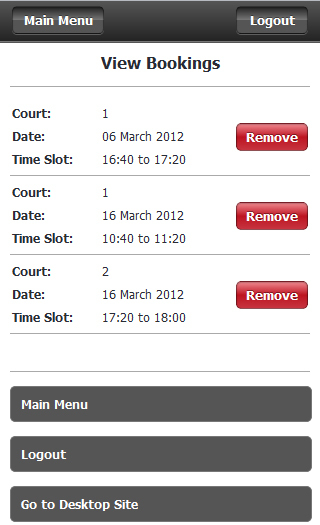 This allows your organisations administrators to manage users and bookings. Our Mobile Booking System allows your members to make reservations online using their Apple iPhone or Andriod mobile phone. This gives your members the flexibility to book when out on the move. 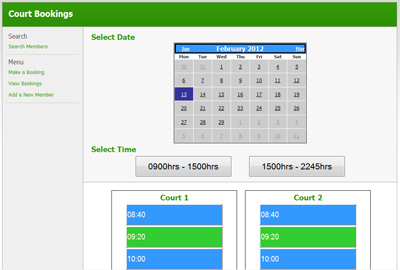 Our system comprises of two parts, our online cloud servers and our onsite touch screen booking systems. By using the latest in cloud computing technology we ensure that all your data is kept available and secure. Our Online Booking Systems are hosted on our cloud servers utilising high availability meaning no downtime of your reservation portal.